In areas exposed to armed conflict or violence, it is not uncommon for people to be seriously hurt by weapons or explosives. Such is unfortunately the case in central and western Mindanao in the Philippines, where hospitals and community health facilities quite often take in patients wounded by weapons. To boost the capacity of medical professionals and health facilities for treating people injured by weapons, the ICRC organizes annual training for surgeons in this specialized field. Two surgeons working in central and western Mindanao were selected to participate in a one-week Surgical Seminar on the Management of Patients with War Wounds in Geneva, Switzerland, in March. Through the training, Dr Cruzado had the opportunity to exchange experiences and best practices with 40 participants from other countries. A native of Pikit municipality in North Cotabato province, Dr Cruzado has witnessed decades of armed fighting in that area and its adverse consequences on the civilian population. As such, he decided to become a surgeon and returned to his birthplace after his medical studies. “I know that my place is a conflict area so I can do a lot for the people as a doctor. 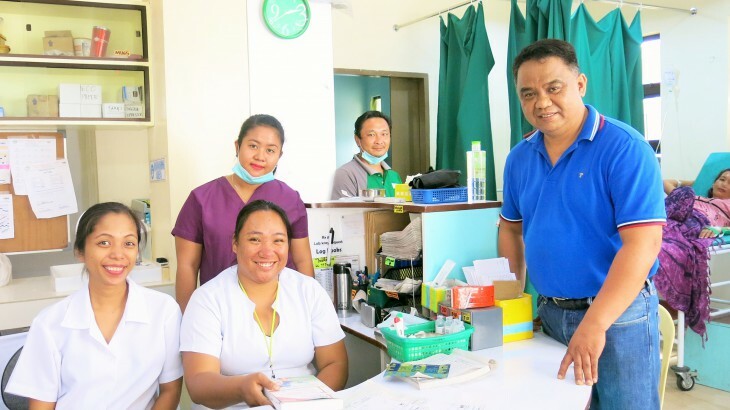 As part of its mandate to help people affected by armed conflict, the ICRC supports six selected government hospitals in conflict-affected areas of Mindanao through the quarterly donation of medicines and medical supplies. These are the Cotabato Provincial Hospital and Maguindanao Provincial Hospital (in central Mindanao), Zamboanga City Medical Center (in western Mindanao), Agusan del Sur Provincial Hospital, Lianga District Hospital and Marihatag District Hospital (in northeastern Mindanao). This regular support aims at enhancing the hospital’s capacity for stabilizing and treating weapon-wounded patients. Other health facilities receive ad hoc support from the ICRC to address gaps and provide proper medical intervention to patients. The ICRC also assists weapon-wounded patients for their physical rehabilitation at Davao Jubilee Foundation, which the ICRC has been regularly supporting. Thanks to the training, Dr Cruzado will be able to apply this new knowledge – and share it with colleagues – to help save more lives in his hometown where conflict and other situations of violence are a regular occurrence.